Today at the National League of Cities Conference. 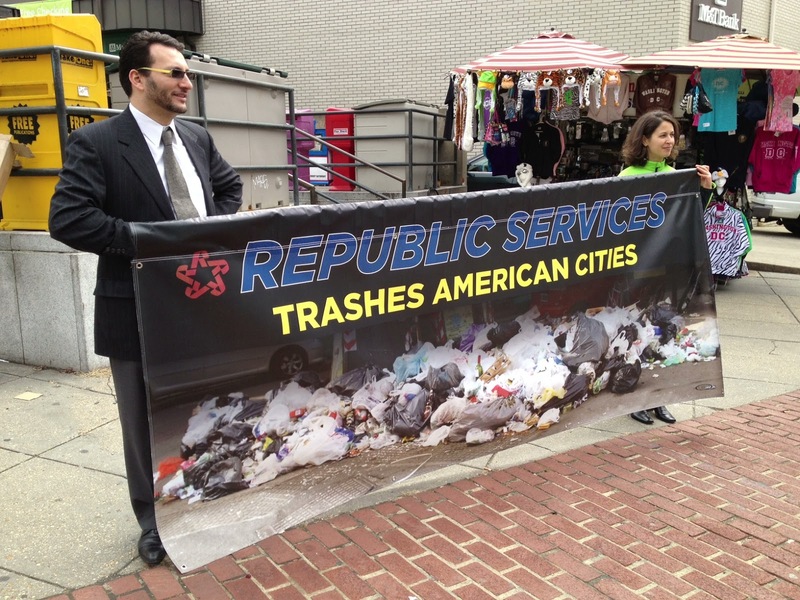 Count on Republic Services for more trash service disruptions, Teamsters today told 2,000 city officials attending the National League of Cities Conference. Republic's attacks on its workers triggered picket lines in more than a dozen cities last year alone. Teamsters held a giant banner that said, "Republic Services Trashes American Cities" at the entrance to the conference hotel. It couldn't be missed by the thousands of mayors, administrators and city council members attending the conference. Teamsters alerted municipal elected officials about how they can protect their city from Republic-initiated lockouts and trash service disruptions. 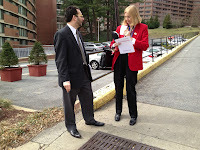 Municipalities can find more information about Republic’s trash service disruptions at: www.PickUpTheGarbage.com. In the current economy, most municipalities’ finances are hard-pressed, with a difficult local fiscal situation now exposed to the uncertainty and fallout generated by the Federal sequester and overall budget impasse. Effective procurement and stable services are even more important in these difficult times. “When large waste and recycling contracts are at stake, it is important that municipalities understand what they’re getting with Republic Services/Allied Waste,” said Robert Morales, Director of the Teamsters Solid Waste, Recycling and Related Industries Division. In Evansville, Ind., Republic locked out its workers and left the city without reliable trash service for six weeks. After being locked out without pay for a month, the Indiana workers took their picket lines to other cities across the United States. 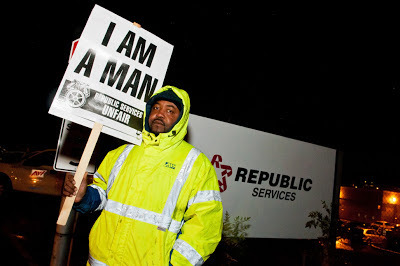 Fellow Republic/Allied Waste workers refused to cross picket lines in Wayne, Mich.; Urbana, Ill.; and Richmond, Milpitas and Long Beach, Calif. 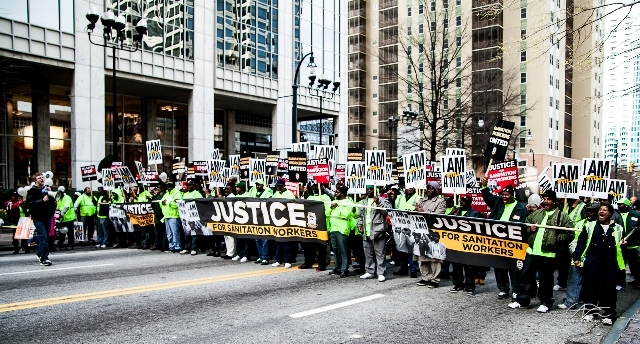 In Mobile, Ala., Republic/Allied Waste refused to honor a binding contract with its sanitation workers. The workers were forced to strike to protest the company’s illegal behavior, and took their picket lines to other cities across the country. Fellow Republic/Allied Waste workers refused to cross picket lines in Buffalo, N.Y.; Columbus, Ohio; and Seattle, Bellevue, Kent and Lynnwood, Wash. In Memphis, Tenn., Republic is discriminating against its workers—soiling the legacy of Martin Luther King, Jr. in the city where he died fighting a righteous battle for fair treatment for hard work regardless of race or union status. Workers in Memphis and cities across America are at a boiling point over the chronic attacks on their dignity. One of the many Republic Services picket lines this year. Republic/Allied Waste’s total revenues were more than $8.2 billion in 2011, with profits of more than $589 million. In May 2012, the same month it locked out its workers in Evansville, the company approved a death and disability benefit for its CEO valued at more than $23 million.